45.5mm carbon fiber case, carbon fiber bezel with 6 H-shaped titanium screws, black composite resin lateral inserts with carbon at 9 o'clock and black composite resin bezel lugs, red sapphire crystal with anti-reflective treatment, sapphire dial with satin-finished rhodium plated appliques and hands, white luminescent on hands, red chronograph second and minute counter hands, Unico self winding chronograph flyback HUB 1241 movement with column-wheel, approximately 72 hours of power reserve, black rubber and schedoni leather strap with red stitching (also comes with additional red strap), deployant buckle. Water resistant to 100 meters. 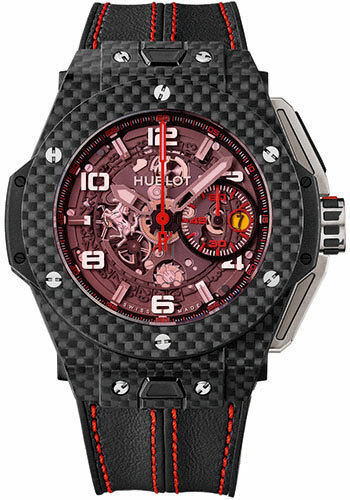 45 mm carbon case, black and red composite resin end pieces, undirectional carbon bezel, sapphire crystal with anti-reflective treatment, sapphire dial with Ferrari applique, rhodium-plated and faceted polished black nickel, aluminum APS, microblasted, black nickel, Unico self-winding movement, approximately 72 hours of power reserve, black rubber and alcantara strap with red stitching, black PVD titanium and mat carbon buckle. Water resistant to 100 meters.